Despite the growing number of publications on television formats, specific theorisations regarding formats and format adaptation, in particular, are still rare. In this article, I introduce a synthesizing approach for studying format appropriation. Drawing on format study, media industry research and structuration theory, I suggest that television formats should be understood and studied as a process of cultural negotiation in which global influences and local elements amalgamate on various levels of television culture (i.e., production, text, and reception); every level includes several sites of symbolic or actual negotiation. These sites emerge in the duality of structure and human agency. Format study is gradually establishing itself as a focal point in television studies. Themed publications, such as this special issue of VIEW Journal of European Television History and Culture, contribute to making the work of format scholars more visible. 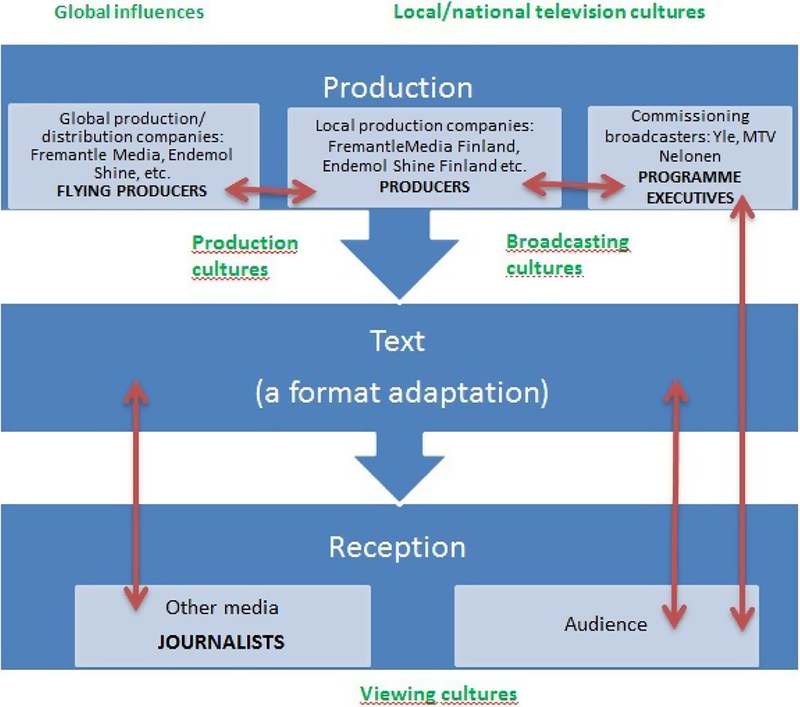 However, considering the number of publications on television formats and their adaptation, dedicated theorisations are still rare.1 Many format scholars now agree that the adaptation of a television format is not simply about ‘illing the format with local content’2 but an interactive process including negotiation among different television cultures. ‘elevision culture’refers to a cultural sphere, which includes three levels: production, text, and reception. Television cultures themselves are historically formed and transformed in the interplay of national and international influences on all three levels.3 As a form of cultural industry, television can be described by its primary logic, “ariation within the constraint.”4 The television format exemplifies this logic: despite the standardised nature of television formats, adaptation always demands individual authorship and creativity. To take all these factors and levels into account is to study television format as a complex cultural formation. Thus, I suggest that television format should be understood as a process of cultural negotiation in which new forms of culture are produced in the duality of structure and human agency, where cultural influences and elements are amalgamated on various levels (production, text, and reception) of television culture. Accordingly, we need a synthesizing, multi-focus approach for studying format appropriation. In this article, I introduce a theoretical model that brings together various approaches that format scholars have adopted to date. The model aims to address three problems that can be identified in existing format studies. First, studies of television formats tend to focus either on the cultural adaptation of individual formats through textual analysis, or on the global format trade, using a political economy approach. In my view, a more holistic approach is needed. Drawing on media industry studies, the aim of my approach is to integrate analyses on various levels of the format industry, combined with the temporal dimension, the history. The second problem stems from the tendency to see television cultures as separate (national) entities and to study how a television format originating in one (national) culture is adapted in another. To avoid methodological nationalism and the resulting dichotomy between global and (national or) local, I suggest that we shift the focus from exploring differences between the original and the adaptation to identifying and exploring the various sites where cultural negotiation takes place. Third, as most studies provide textual analysis on format adaptation, they ignore the fact that structures both restrict and enable the practices of human agents. My approach aims to bring structuration theory and the question of power into the study of television formats. I will discuss each of these problems and attendant aims in detail and then present an example of my model in the context of Finnish television culture. I begin by introducing some of the earlier theorisations of the television format as the background to my approach. The scholarly interest in television formats sparked in the 1990s with the recognition that television programme adaptations and remakes were far from occasional and accidental.5 Since Albert Moran’s ground breaking work Copycat TV,6 a steady growth in publications on formatted programming has been apparent, but it would still be fair to argue that format study internationally is an emerging field.7 Thus, it necessitates theoretical and methodological cultivation. Initially, Moran defined the television format as “a set of invariable elements in a programme out of which the variable elements of an individual episode are produced”.8 A format thus functions like a cooking recipe.9 Moran also stated that format can be seen as a means of organising individual episodes of a programme: “The crust [of the pie] is the same from week to week but the filling changes”.10 Considering most of the current television formats, these two views can be combined: the television format provides an organizing framework both for the programme as a whole and for the individual episodes. In his later works, Moran revisited the concept and described television format as “the total body of knowledge systematically and consciously assembled to facilitate the future adaptation under license of the programme”.11 Thus, format can be seen as a technology of economic and cultural exchange. The degree of adaptation, creativity and authorship has been roughly conceptualized by categorizing television formats as open and closed. In the case of a closed format, each version must closely follow a highly standardized formula, while open formats are more tolerant of variation.15 The concept of adaptation is widely used in format study, but unlike in adaptation studies where it refers to the transfer from one medium to another, it describes the cultural appropriation of a television programme. The most common form of adaptation is to use national/local hosts, actors and participants speaking the national/local language. The need for adaptation is often explained by the idea of cultural proximity: viewers prefer programming that is the most proximate culturally.16 A number of other concepts are also used to address adaption. Recent conceptualizations range from highlighting indigenization to emphasizing the aspect of mixture. Adaptation can be described as localization,17 transformation from international into national or foreign into local,18 combining foreign and local cultural sensibilities,19 or hybridization of geographically-located styles and forms,20 just to mention a few. Miriam Stehling suggests that the concept of translocalisation emphasises the practices of negotiation between the local and the global without reproducing a conflicting relationship between the two.21 I will return to the considerations on the relationship between global and local and national and international later in this article. ‘Media industry research’ suggests adopting an approach that combines research at various industry levels and sites. Media industries have attracted the interest of scholars of various fields for decades, and different aspects and dimensions of the media industry have been studied in a large number of works. Most of these studies have focused on one medium, one industry branch or a certain period of time; but, as media industries are now converging in all imaginable ways (e.g., technological, political or cultural), a broader perspective is needed. Thus, Jennifer Holt and Alisa Perren suggest we should approach media industry research as a distinct field of study housing diverse academic traditions and enabling an integrated analysis of media texts, audiences, histories and culture.27 The newly emerged field is also supported by a recently established journal entitled Media Industries Journal. Drawing on media industry studies, I suggest that the notion of cultural negotiation can be applied to analyse various levels of television culture and format industry in particular. ‘Culture’ in cultural negotiation refers to a wide range of meaning-making processes within production, text, and reception, and includes both material and symbolic aspects. Apart from referring to the actual business negotiations concerning the terms of the format contract or negotiations between the format licensor and the licensee regarding the adaptation of the format, cultural negotiation can be used to describe broader cultural or symbolic negotiations within television cultures, such as adopting new televisual forms as part of everyday viewing practices. To study the television format as cultural negotiation offers a methodology and a conceptualization of the historical and contemporary relationships between production, text, and reception. Most concepts used to describe cultural confluence assume a clear distinction between national and foreign, local and global. For this reason, hybridity is also problematic; it can only exist in opposition to purity. We can only transcend borders if we first acknowledge them.30 This, in turn, causes us to hold on to methodological nationalism. As Esser noted, the attraction of a monolithic, pure and stable space–culture relationship seems to remain, no matter how conflicted and untenable.31 Words used to narrate the adaptation process, such as localizing, remaking, translating, customizing and domesticating,32 also imply that there is a stable format at the core. Television executives however, acknowledge that it is not uncommon for formats to be developed by taking into account the experiences and innovations of different adaptations. Video 1: UK television executives discuss format adaptation at the Creative Content Summit 2012. Go to the online version of this article to watch the video. The discussion in this video is one of the many examples indicating that television cultures consist of never-ending borrowings, inspirations and frequent exchanges of ideas and aesthetics.33 As these borrowings have taken place since the advent of television and seem to be multiplying, we cannot separate the local from the global. Furthermore, this suggests that there is little relevance in highlighting the differences between format adaptations and the original programme. Instead, it seems more sensible to study which elements or features of the television format create the need or desire for changes and why—be they cultural, economic, or political. However, avoiding methodological nationalism is far from an easy task, as our thinking is deeply engrained by national boundaries and national cultures. Also, “whether cultural exchange concerns individuals, institutions or communities, it usually takes place with the concept of nation as a vehicle”, as Gunhild Agger argues.34 This is still very true with broadcast television, which in many cases is characterised by national institutions, national audiences and national languages.35 Cultural negotiation is my attempt to overcome the dichotomy between international and national, global and local. As Stehling argued, it is the “simultaneous and overarching dynamics, which are important” in the case of TV formats.36 Thus, instead of attempting to trace the marks of (presumably clearly defined) different television cultures, my aim is to identify the sites and moments of cultural negotiation where tensions are recognized and resolved and creative freedoms find their expression. By studying the television format as a site of on-going cultural negotiation, I wish not to deny the relevance of local, national or global cultures, but to avoid methodological nationalism. ‘Culture’ involves both the active and creative capacity of human beings to construct shared meaningful practices in their everyday lives and the signifying practices that generate meaning as an outcome of structures.37 Also, media industry research perceives culture and cultural production as sites of struggle, contestation and negotiation between a broad range of stakeholders.38 Thus, in order to understand cultural negotiation, we need to study the structures and agencies involved in that process. ‘Social reproduction’ indicates the repetitive character of day-to-day life (i.e., the routines).42 The important structure of a television network, for example, is the complex sum of these daily routines and creative work of its owners, managers, directors, writers, technicians and actors, who work within rules and resources set by those who own and run the structure.43 ‘Agency’ does not refer to the intentions people have in doing things, but to their capability of doing those things in the first place.44 Human agency in the television industry thus demands familiarising oneself with the prevailing rules and norms while also making use of one’s personal expertise and experiences. In format adaptation, we must not just consider the industrial structures and the standardisation of the final product, but also the creativity and authorship needed to appropriate them. Human agency also includes the capability to reflexively monitor the flow of social life—the actions of the agent him/herself and of other human beings.45 In the context of the television industry, it is not only the actions and reactions of colleagues that are being monitored, but also those of audiences. As Straubhaar stated, the expectations of audiences and the feedback they provide form boundaries within which producers work. Television audiences thus structure television networks and professionals in a subtle way by controlling how they employ the resources available to them. Naturally, audiences are also shaped by what they are given to watch.46 Action logically involves power in the sense of transformative capacity,47 but the power is not distributed evenly—television executives and producers have more power in terms of determining television programming than the audience. To elucidate my appeal for a more holistic methodological approach, I provide an example, drawing on Finnish television culture. Albeit offering a simplified picture of format appropriation, Figure 1 summarizes the main points. I then briefly discuss the structures, agencies and practices contributing to cultural negotiation. As each level of the television culture (production, text, and reception) includes multiple sites of cultural negotiation, I will also introduce some of these sites. Figure 1. Sites of cultural negotiation in Finnish format appropriation. 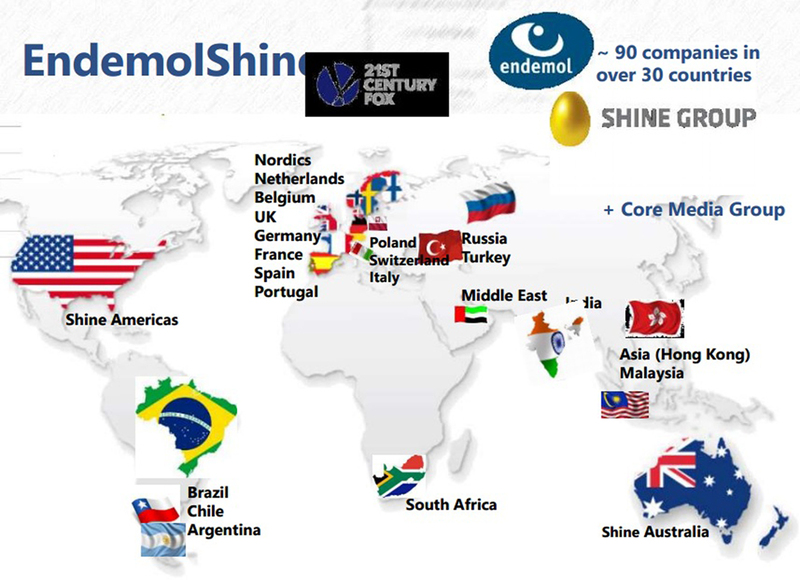 The global giants sell formats from their catalogues as well as produce their own local adaptations. 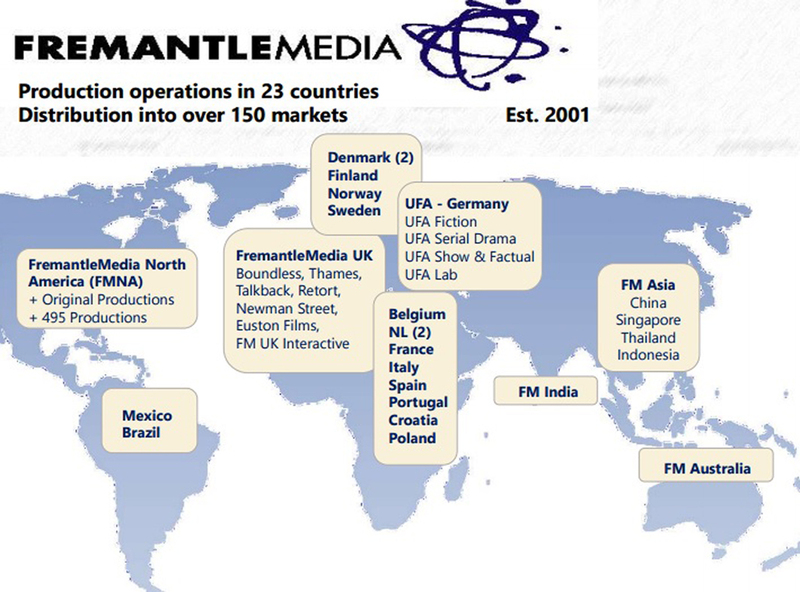 The CEO of FremantleMedia Finland, for example, reveals that she prefers the company catalogue when pitching new programme concepts to Finnish broadcasters.54 But whether the formats come from the parent company or from a third party, the local production companies negotiate between global influences and the respective national television cultures (presented with green letters in Figure 1) while choosing formats for their home market. This and other sites of cultural negotiation are indicated with red arrows in Figure 1. While the content of these adaptations is local, the systemic conventions of the format apparatus are both deterritorialised and naturalised.55 As formats travel across national and cultural borders, they also transfer expertise and knowhow, including proven practices of format acquisition and appropriation. Thus, the local and national television industries around the world are engaged in the reproduction of global structures. In the case of Finland, all of the main broadcasters, Yle, MTV and Nelonen, operate primarily on a national scale. They broadcast to national, Finnish-speaking audiences and must compile their programming accordingly. The decision to commission an adaptation of a foreign programme format is therefore the result of negotiation between a particular channel, its schedule and programming policy and a global television format carrying influences from around the world. The broadcasting system adds another dimension to these negotiations, as public service broadcasters and commercial broadcasters have different values, obligations and audiences.56 Adapting a commercial format to public service values or vice versa may add another challenge to the business negotiations on the format contract. It may also have unexpected implications for the reception, as I will reveal later. The format adaptation, the television text, is the final outcome of the various negotiations taking place at the level of production. At the reception level, the audience and other media negotiate the cultural meanings of the format adaptation. Although both producers and viewers create and interpret programmes within a common cultural context,61 there is always the possibility of audiences considering a format as something that is not compatible with their everyday life and values. At this final level, we thus see negotiations taking place with regard to the adoption of (new) forms and content as part of a particular viewing culture or cultures (indicated with green letters in Figure 1). Programme pilots, viewer ratings, critics’ reviews and public debates about these programmes are the sites where these negotiations become visible and are subsequently integrated into broadcasters’ and production companies’ decision making. For instance, a heated public debate can result in lower viewer ratings and, eventually, a shorter lifespan for a programme, as with the Finnish adaptation of Got to Dance (Pakko tanssia, Yle TV2 2013). Yle had been looking for a large entertainment format and decided to commission Pakko tanssia. A few months before the show went on air in early 2013, an intense public debate ensued regarding the format. Finnish tabloids published articles questioning the legitimacy of Yle adapting international formats instead of developing ‘local’ content, and this contributed to creating negative audience expectations. The shiny-floor show targeting the numerous dance-enthusiasts in Finland failed to attract large audiences and was not commissioned for another season.62 Even the fact that the programme was successfully promoting public service values by introducing different dance styles, including wheelchair dance, could not save it. The cultural negotiation that took place around Pakko tanssia was part of an on-going public debate about the funding and obligations of public service broadcasting, rather than a critique of the programme itself. What we can learn from directing our attention to the audience level in this case is that cultural negotiation that takes place on one level of the television culture may have real effects on another level. A textual analysis alone could not have suggested this. It should be noted, though, that whilst all the above-mentioned levels involve human agency, some actors exert more power than others (presented with capital letters in Figure 1). As Timothy Havens argues, local programming executives act as intermediaries between viewers and exporters, deciding which programmes to purchase and how to schedule them based upon their own understanding of the culture in which they operate and the target group for which the TV channel works. As television can be understood as the articulation of national audiences, or fractions thereof, television managers and producers receive their authority because they lay claim to being privileged interpreters of viewers’ tastes.63 In the Finnish broadcasting company Yle, for example, it is the commissioner of the particular genre who selects the programmes and sets the frame for the production by negotiating with the executive producer, usually the CEO of the production company. They then hand the project over to the producers of Yle and the production company, who negotiate operational issues during the actual production.64 In a small television market, like Finland, the relevance of human agency is actually enhanced because there are few agents and they are therefore more powerful. The CEOs of the main production companies and the managers of the national broadcasters, a rather small group of people, determine the majority of Finnish television programming. Another group of people that are particularly powerful are flying producers or production consultants, who are often seen as gatekeepers, mediating between the competing demands of ensuring brand protection and supporting the local production team.65 Consultancy means carrying specific production know-how, valuable industrial expertise and a specialised awareness of production organisation and routines to all corners of the world.66 As the CEO of Banijay Finland stated, the bigger the format in question, the bigger the role of the flying producer. In the Voice of Finland, for example, a flying producer from the Netherlands, where the format originated, constantly supervised the production of the blind auditions and the subsequent rounds.67 Thus, flying producers often exert considerable agency in format adaptation. Methodologically, studying multiple levels and sites of cultural negotiation within the context of one research project means that a variety of materials and methods are needed. These may include interviews with audience members and industry executives, statistical analysis of format imports and adaptations, historical research concerning the format of interest, ethnography regarding production practises, and textual analysis of television programmes and production documents. Identifying and understanding the sites of cultural negotiation also demands temporal sensitivity. Figure 1 only presents the sites of cultural negotiation at a given point in time. Prior to the 1990s, the structures, agencies and practices of the format trade were very different.68 In Finland, for instance, some of the very early unauthorized programme adaptations became milestones of Finnish television culture. Tupla tai kuitti and Levyraati are two of the longest-running shows in Finnish television. Tupla tai kuitti, a quiz show that first aired on TES-TV in 1958, was a copy either of the Swedish Kvitt eller dubbelt (also aired as 10.000-kronosfrågan) or the Italian Lascia o Raddoppia? – both were adaptations of the American original, The $64,000 Question. Tupla tai kuitti was on air for 30 years and returned after a break for two years in 2007. Levyraati, an adaptation of the BBC’s music panel show Juke Box Jury (itself an adaptation of American Jukebox Jury), premiered on Tesvisio in 1961 and was broadcast for about 40 years.69 As Albert Moran argues, “National television in the past always had a transnational dimension”.70 After 60 years of adopting and assimilating imported ideas, models and practices in Finnish television, there seems little justification in studying what is “Finnish” and what is “foreign”. Instead, we should aim to identify and analyse the levels and sites of negotiation in format appropriation. As Andrea Esser points out, format variations are grounded in a complex matrix of factors.71 The variations and reasons for them are not documented in one contract, or even determined in one discussion, not even when the most powerful agents, the format right owners and local production executives meet. Television formats, just like genres, are bound and shaped by both cultural parameters and material conditions defined by political economy, network structures, work routines and other factors.72 As format trade and format adaption involve multiple levels and sites of cultural negotiation, they should all be considered in format study. Drawing on media industry studies and Anthony Giddens’ structuration theory, I suggest a more holistic research approach for studying television format: as cultural negotiation. Apart from referring to the actual business negotiations on the format contract, it can be used to describe broader cultural and symbolic negotiations within and between television cultures. The concept helps to synthetize studies on global format trade and programme-specific research on format adaptation. By identifying and studying the sites of cultural negotiation instead of analysing cultural specificities, the approach aims to make visible the various reasons for changes in the adaptation process and the historically transnational and fluid nature of television cultures. It thus overcomes the local–global dichotomy and avoids methodological nationalism. Like any other branch of cultural industries, format production and adaptation involves repetitive practices, constraining and enabling institutions and creative individuals. Hence, the approach also aims to study the changing relationship between the structures of television industry and the human agency of television professionals and audiences. Television cultures gradually transform as new genres, styles and contents are adopted. Producers, scriptwriters, directors and other production personnel familiarize themselves with new production practices while producing local versions of imported television formats, and further develop these practices in the context of the national/local production cultures. As local production companies are increasingly owned by global conglomerates, they are faced with the challenge of assimilating their traditions with those of their parent companies, again transforming the local production culture. Audiences and television critics interpret and negotiate the meanings of international television formats; some formats and related practices are found proximate enough to be accepted, and some are criticized and rejected—for a variety of reasons. All three levels involve constant negotiation and transformation. Ultimately, studying television format as cultural negotiation is a holistic approach that offers the ability to explore the various levels of the television format industry and the duality of structure and agency beyond the global–local dichotomy. Heidi Keinonen is a post-doctoral researcher at the Turku Institute for Advanced Studies, University of Turku. She has previously studied television history, multi-platform productions, television drama and programme formats, and has published articles in Critical Studies in Television and Media History. Her current research examines the importation and adaptation of programme formats in Finland.